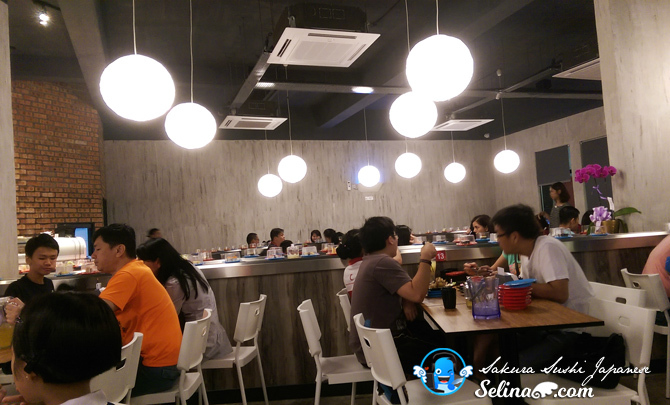 Sakura Sushi, Japanese restaurant just opened when they located at Bandar Kinrara 5, Puchong in Malaysia. 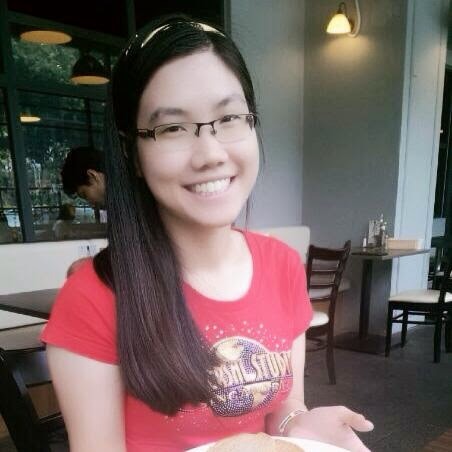 It is next to LRT Station BK5, and Old Town White Coffee in my neighborhood only! All sushi cost RM1.70 and RM2.70 on the belt sushi only, so this is very cheaper and -RM0.10, compare to Sushi Mentai. 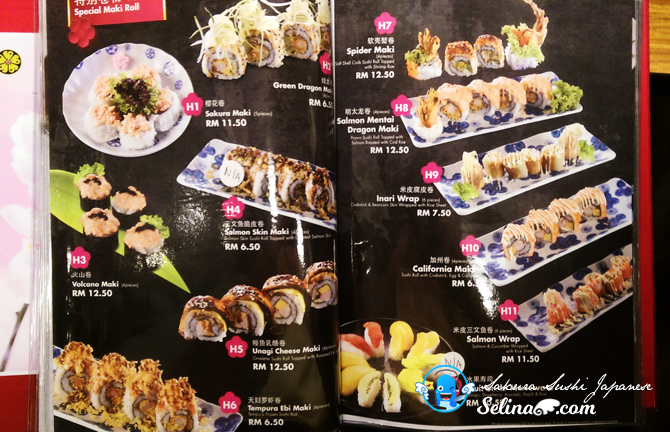 If you want the sushi with cheapest of prices, you would choose Sakura Sushi, with just pay RM30-50 on the bills when you bring 3-4 persons in your group only! 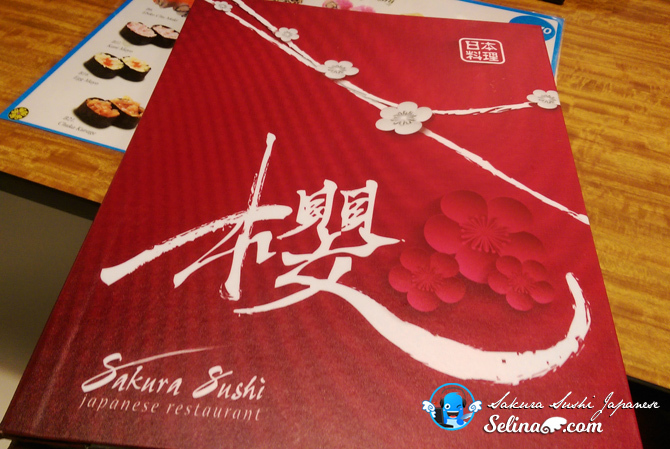 The menu book that really caught my attention so the sakura design are very good. I drove to Bandar Kinrara then, suddnelly I saw the banner set up along the street of BK5 near the Petronas Petrol Station. 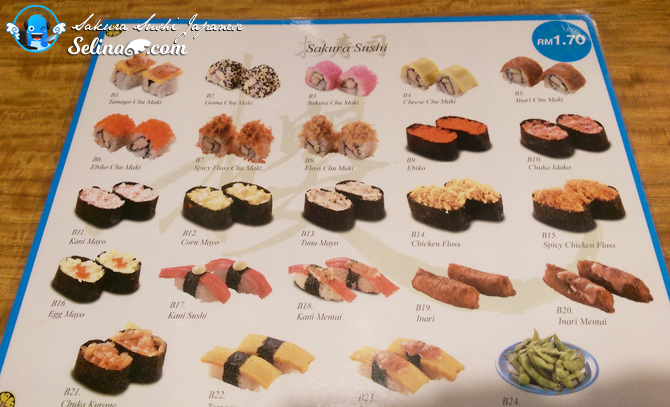 I thought of my family try the cheapest of Japanese restaurant, Sakura Sushi in Bandar Kinrara 5! My family, grandma and I reached BK5, and looked at the Sakura Sushi restaurant looks as bigger so awesome! Their sakura logo are attractive with the brush ink painting design on a Chinese character; "Sakura" or "Cherry blossom" looks nice!! I liked it. And the sushi ingredients are a little better and try to be different new. My grandma love to eat sushi so she enjoyed it much! 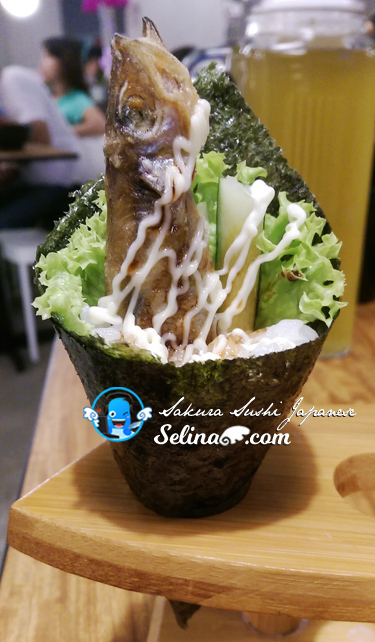 First time my mom order a special Shisamo Temaki because this fried fish are very tasty! And the Unagi Cheese Maki are delicious too! Not bad. Don't worry, you can refill the green tea so free. I saw many people come to eat sushi during the dinner time, or sometimes the parent who enjoyed to eat sushi while they are waiting for the students who studied the tuisyen center beside this restaurant only! 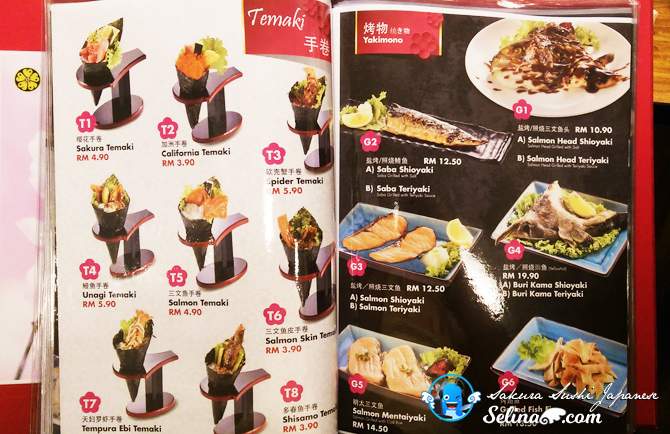 We given the menu of sushi choices; blue - RM1.70 and red - RM2.70. My favorite sushi are Salmon Mentai and Egg Mayo. 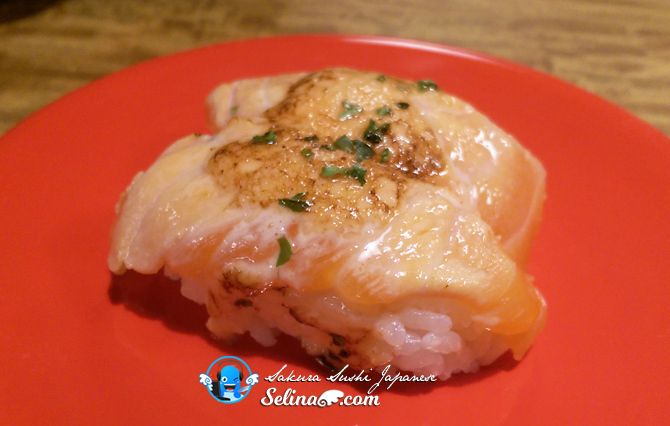 Everytime, I must choose Salmon Mentai when I went to any sushi restaurant because I fall love in the salmon so very much! 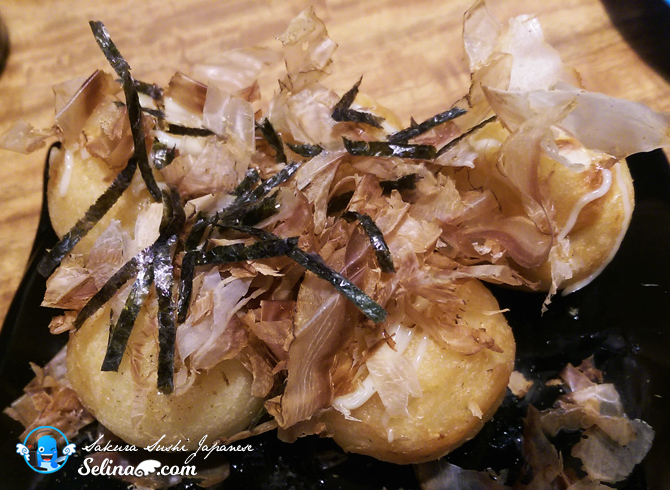 Lastly, I ordered my favorite takoyaki, and get 5 pieces! Yummy! It make me love Sakura Sushi so much! Normally, the takoyaki stalls only give 3 pieces so mostly. There are the Don choices with free miso soup. 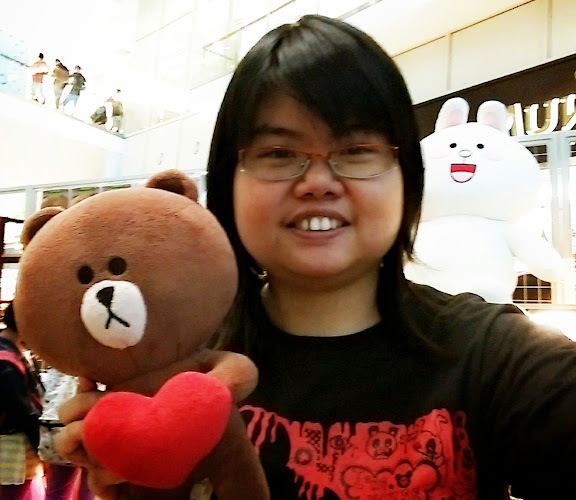 All don prices from RM8.50 to RM20.90 only. It looks cheap! 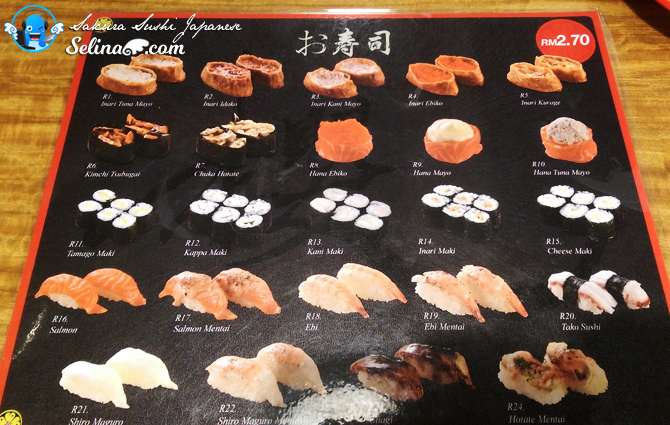 And many different of choices such as salad, sashimi, special maki sushi, and ramen. I felt that it's really worth to eat this! 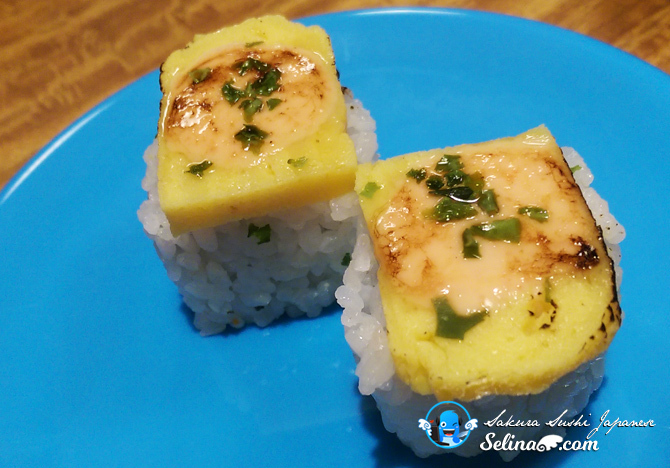 You can enjoy to eat great sushi without worry of spending a lot of money. 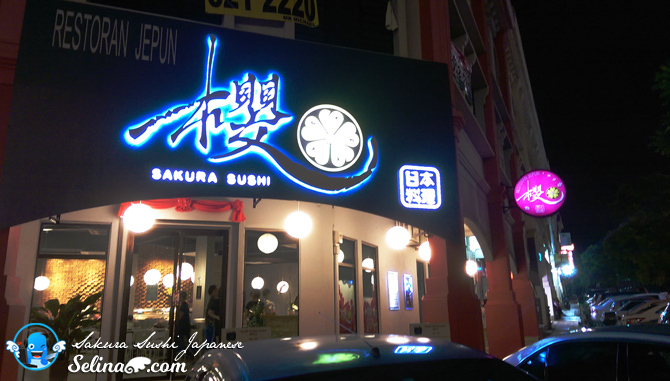 I think that Sakura Sushi will be first cheapest sushi to take over the Klang Valley soon! 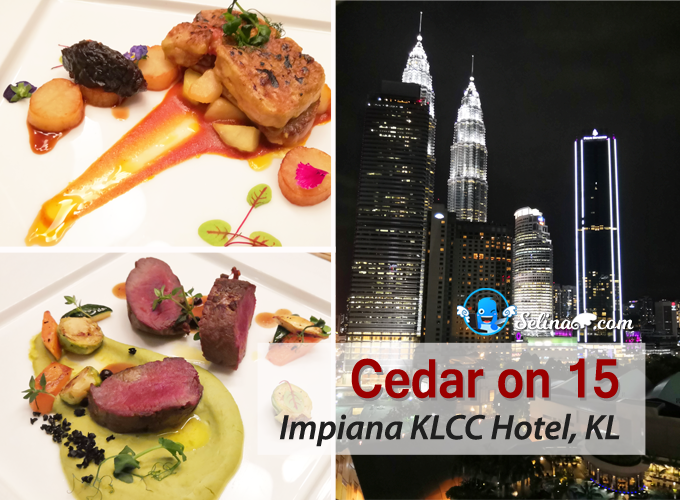 I also heard that Pandan Indah, Cheras in Kuala Lumpur get Sakura Sushi, 1st branch too. wow the price is really cheap! Hope they will open an outlet at Selayang soon! 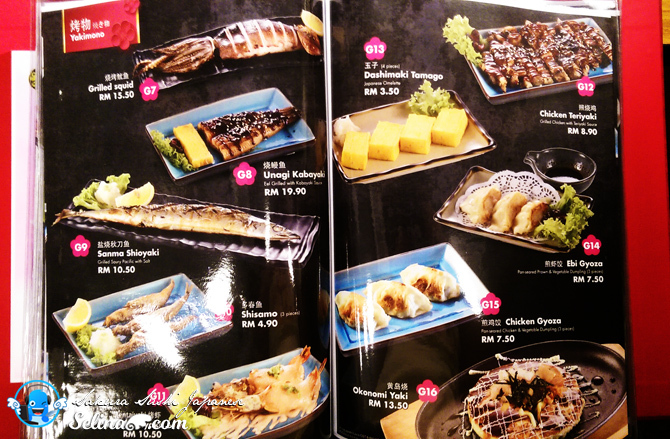 Oh the prices are really affordable for the dishes.The takoyaki looks really good too, so will definitely stop by for a visit to try them out. I loved sushi so much that I bought a sushi knife kit to make it at home!